The 10 Best RV Trips To Take In New York - Must See! As one of the most populous cities in the world, New York City is a melting pot of culture and activity. Each year, more than 52 million people from around the globe visit the Big Apple. But the Empire State is home to much more than the famous city. It’s diverse in its geography; the landscape varies between lush, green forests, towering mountain ranges, meadows, lakes, and farmlands. New York is an outdoorsman’s paradise, offering picturesque landscapes as far as the eye can see. As such, it’s a popular destination for RVers. Most of New York’s highways are well-cared for, providing a peaceful, scenic drive for even the pickiest of RVers. And, while the metropolitan area may not have a wealth of campgrounds, there are plenty of RV parks in New York’s more rural and suburban areas. It’s a wonderful state in which to plan your next road trip. From hidden gems to well-known tourist destinations, there are enough natural wonders and attractions in New York to keep you occupied for months. In this article, we’ll highlight some of the best road trip stops in the Empire State. Make sure to visit this beautiful park during the hot summer months, as its swimming hole is among the best in the state. With nine miles of hiking trails and 12 separate waterfalls, Robert H. Treman State Park offers a relaxing day trip for beginners – quite literally a walk in the park. Lower Falls is the big draw here; it’s a large swimming hole complete with a lifeguard, diving board, and a cascading waterfall to set the backdrop. The park offers other amenities as well, including showers, pavilions, and picnic tables with nearby grills. The hiking trails wind through the Enfield Glen Gorge, leading to the formidable Lucifer Falls, a 115-foot waterfall that offers dizzying views of the woodlands below. Of course, fishing and hunting are other popular activities in the area. During peak season, there are scheduled recreation programs and guided tours. Isn’t it great when you don’t have to travel far to park your rig for the night? Robert H. Treman State Park has a selection of RV sites, tent sites, and cabins for rent, right on premise. 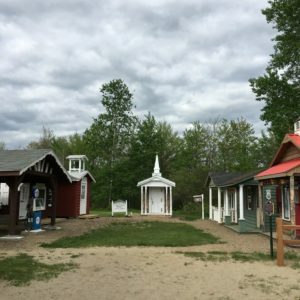 Campsites vary from $18 to $28 per night, plus a $5 fee if you’re not a New York state resident. There are 63 pet-friendly RV sites which can accommodate RVs up to 45 feet in length. Some offer electrical hookups as well. I’m sure you’ve heard of the great American road trip before, right? But have you heard of the miniature version of Route 66? Probably not. Speculator is a tiny village in the Adirondack mountains of New York, home to about 300 people. It’s here you’ll find Mini Route 66, built by John Van Buiten and his long-time friend, Richard Koert, as an homage to Van Buiten’s honeymoon trip with his wife. Looking like the something out of the movie Big Fish, the village is complete with a general store, a church, a schoolhouse, and a barbershop. Each building is no larger than 96 sq. feet, and each is furnished with antique décor and furniture true to Route 66’s heyday. While you can’t go inside the buildings, there’s ample opportunity to take a peek in the windows or snap a few photos of this adorable village. There’s also a beach right across the street in case you get hot and want to take a dip! Moffitt Beach Campground is just a few minutes to the west and offers 261 campsites. Many sites are waterfront and have boat launches. Campground amenities include a bathhouse, firewood sales, picnic areas, beaches, and a swimming area. There’s also an onsite recycling center and dump station. Camping fees are $22 per night, plus a $5 fee if you’re not a New York state resident. Whoever gave Lake Placid its name was perfectly accurate. Situated high in the Adirondacks, Lake Placid is a tranquil and beautiful community, surrounded by alpine views and mountain breezes. It’s the perfect getaway for travelers any time of year. Late spring and summer offer aquatic adventures on the lake, like boating, jet-skiing, parasailing, kayaking, and much more. Fall is the perfect time to hike one of the 46 High Peaks in the area and check out the awe-inspiring foliage. Come winter, skiing, snowshoeing, and tobogganing adventures abound. 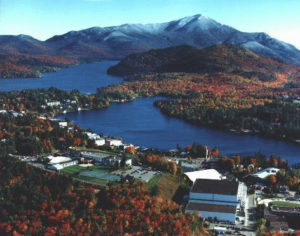 Lake Placid isn’t just known for its outdoor activities, either. Main Street is home to dozens of mom-and-pop shops selling everything from antiques to sporting goods. You’ll also find a handful of spas and salons for when you need a day of pampering. If you get hungry, Lake Placid offers a diverse selection of locally grown foods at its many eateries. Bistros, cafes, diners, pubs and taverns, and upscale restaurants can be found around almost every corner. There are dozens of lodges throughout the mountains and along the lakeshore. If you’re looking to camp in an RV, however, you’ll have to either get creative or head outside of town. You can check out this list of RV parking in New York to find nearby sites. Alternatively, the Lake Placid/Whiteface Mountain KOA is about 20 minutes from downtown Lake Placid, in the nearby town of Wilmington. It’s a top-rated campground that offers full hookups, cable and wifi, a pool, and a small grocery store. Rates vary, check the website for details. The Thousand Islands have an endless supply of activities for everyone in the family. With a name like 1000 Islands, it had better, right? 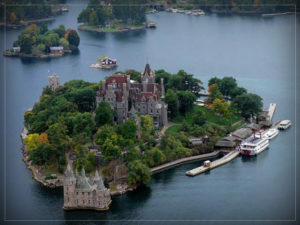 Located on the border of New York and Ontario, Canada, the area is home to miles of shoreline, hundreds of bays and inlets, and of course, a thousand islands. (Technically, there are 1,864 islands in the region). Boat tours are one of the most popular activities in the area, as they give guests the chance to catch views of the majestic castles, lighthouses, mansions, and other sights that await at each island. 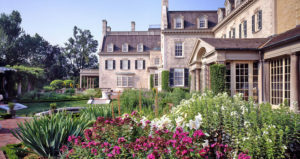 Each town in the area has something worth exploring, be it a brewery or vineyard Cape Vincent, a historic castle in Alexandria Bay, or North America’s largest collection of antique boats in Clayton. Don’t worry – there’s plenty of stuff for the kids, too. The Thousand Islands is also known for its bevy of adventure sports, like paddle-boarding, zip-lining, scuba diving, and flyboarding. Address: The New York side of the Thousand Islands is accessible from Route 81 North. There are more than a dozen state parks in the area, many of which offer overnight RV parking. Wellesley Island State Park is in the heart of the 1000 Islands region, convenient to hundreds of nearby attractions. Amenities include a camp store, laundromat, arcade, and a small golf course, and the Minna Anthony Common Nature Center and butterfly house. Rates vary from $18 to $36 per night, plus a $5 fee if you’re not a resident of New York state. 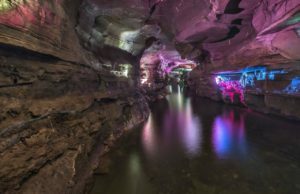 Howe Caverns is one of the most popular tourist destinations in the Empire State, and for a good reason. 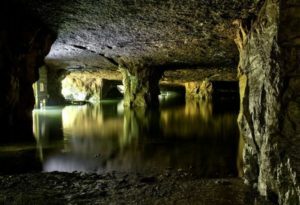 This underground cave system is the largest one in the Northeastern United States. The caverns were discovered by a farmer in 1842, and since then, have attracted millions of visitors over the year. Now, the site is full of opportunity for family fun, including a zip-lining, rock climbing, mining, and hours of cave exploration. Price: Traditional cave tours are $25 for adults, $22 for seniors, $21 for kids 12-15, and $13 for kids 5-11. Kids 4 and under are free. There are two nearby campgrounds: Hide a Way Camp Sites and Twin Oaks. Hide A Way is just a few minutes to the north and offers full hookups, a fishing pond, recreation hall, country store, and more. Rates for sites with w/e hookups start at $30 per night. Twin Oaks is just to the south and offers a bevy of outdoor sports and activities, a lake, a camp store, hay rides, and more. Rates are $41 per night for full hookups. If urban exploration tops your list of things to do, don’t forget to add Widow Jane Mine. What was once a cement mine until the 1970’s is now an abandoned cave that’s open to the public. But to say it’s abandoned doesn’t necessarily mean it’s completely devoid of life. The mine has been used for a variety of odd activities over the years, from a mushroom farm to a trout nursery, to a recording studio. On most days the mine is empty, save for a small museum and a nearby walking trail. On other days, however, it comes to life as a performance art venue, gallery, or space other community events, so make sure you check the calendar before you visit! It’s certainly an interesting place to attend a show; its dark corners and eerie chambers seem to juxtapose the human activity within. Oh – did we mention it’s also reportedly haunted? So-Hi Campground is located in nearby Accord, NY. It’s a large campground with a wealth of activities, including swimming, horseshoes and volleyball, paddle boats, and mini golf. Amenities include outdoor sports courts, a big screen theater, a pond and swimming pool, and more. Rates start at $45 per night for full hookups. It would be impossible to make an RV trip list without including Niagara Falls. It’s a wonderful place to explore and camp, even if you’re just in a New York RV rental for a few nights. There’s more than enough to do at this national landmark, no matter what time of year you visit. Aside from the obvious tour of the falls, there’s also a big-screen Adventure theater, an Aquarium, a Discovery Center, and the thrilling Cave of the Winds. Throughout the park, there are several souvenir shops and eateries, including the Top of the Falls Restaurant, which boasts scrumptious sandwiches and unparalleled views overlooking the falls. 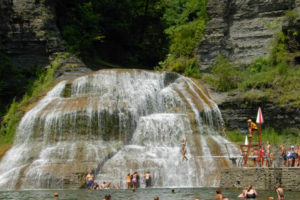 There are several campgrounds on the New York side of the falls, including the top-rated Branches of Niagara Campground and Resort. This high-end resort is located on an eight-acre lake just 10 minutes away from Niagara Falls. Amenities include a heated pool, general store, wagon rides, zip line, canoe and kayak rentals, and more. Rates vary widely, ranging from $44 to $100 per night. The Eastman Museum is a must-see for any photography or film buff. It’s the oldest photography museum in the world and also includes one of the world’s oldest film archives. There are several million objects on display, taking visitors on a tour through the history of photography, cinema, and their respective technologies. The grounds themselves offer ample opportunity to explore as well. This 50-room mansion was built in 1905 and the home has been completely restored to its original appearance. Visitors can take guided tours or wander the grounds on their own. The lush outdoor gardens offer the perfect place to relax or attend seasonal concerts and events. Price: $15 for adults, $13 for seniors, $5 for students with ID, $5 for kids ages 5-17, free for kids 4 and under. Webster Park Campground is likely the closest place you’ll find to camp for the night. After all, Rochester is a relatively large city, and find a place to park your RV is no easy feat. The park offers water and electric hookups and is located right on the shores of Lake Ontario. Rates start at $40 per night for mid-sized campers. Stonecrop Gardens is the ideal destination for a peaceful spring or summer day. These sprawling gardens encompass roughly 15 acres of the mountainous Hudson Highlands. At an elevation of 1,100 feet above sea level, the gardens cover an array of environments, from cliffsides to grasslands, woodlands to wetlands, and more. What started as a private garden is now a massive public space that includes the School of Practical Horticulture. The gardens themselves are a work of design genius. Owners Frank and Anne Cabot, and horticulturist Caroline Burgess battled against a multitude of environmental challenges to create these beautiful and diverse displays. 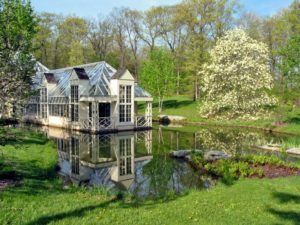 A trip to Stonecrop Gardens isn’t just a walk through the flowers; it’s an in-depth study of how creative garden design can thrive in even the most taxing environments. Though, the flora are pretty nice, too. Price: $5 per person, free for kids under 12. Highland Falls RV Park and Marina is about 30 minutes away and is the closest designated RV park. It’s a scenic park that’s right on the Hudson River and offers lovely views from any angle. Amenities include full hookups and free Wi-Fi. Rates are $49.95 per night. Old Forge is a quaint, historic village with lots of character. It also has something the kids will love: the state’s largest water park. Enchanted Forest has more than 50 rides and attractions, 32 of which are heated water rides. It’s a family-oriented mix of amusement park and water park rides, so there are plenty of rides for all ages. If you get hungry, there are 14 different eateries to choose from, offering everything from simple snacks to delicious summer cookouts. Price: Online tickets are $33.95 for adults and $29.95 for kids ages 3-11. You can’t get any closer than Old Forge Camping Resort. This 400-site resort is right next to Enchanted Forest and sits on a large private lake. There’s plenty of entertainment, including a family lounge, arcade, playgrounds, and much more. The resort offers wooded and lakefront sites with a variety of hookup options. Rates vary; visit the website for details. New York isn’t just about its cities. It’s a gorgeous state that’s packed with diverse habitats and unique natural beauty. A road trip in New York could have you soaking up the sun on the beach one minute and breathing in crisp mountain air the next. With so many options for RV trips and camping, it’s no wonder why there are so many RV dealers in New York. Regardless of whether you own or rent an RV, your whole family will enjoy the amazing destinations we included on this list. Happy trails!